Even since the beginning of the 90ties, Jörg M. Knittel had the idea to form a Death Metal band in the style of BOLT THROWER, MASSACRE or the old CELTIC FROST. But it took him 6 years, to find with René Pfeiffer a vocalist, who fits both from the music and personal aspect perfectly. 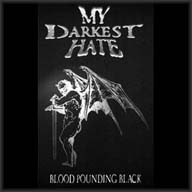 At the end of 1998 MY DARKEST HATE entered the studio for the first time in order to record their demotape "Blood Pounding Black". Since no drummer was found at that time, a drum computer had to be used. The demotape got great reviews in wide parts of the press (Deftone, Ablaze...). 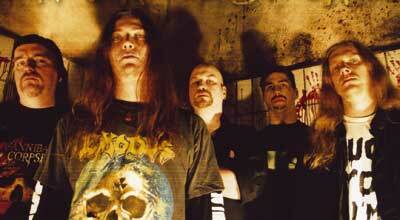 At the end of 1999 the line-up was completed by Klaus Sperling (Drums) and Oliver Grosshans (Guitar). Although all the musicians play in other bands as well (Jörg and Oli at Sacred Steel, Klaus at Primal Fear and René at Azmodan), MY DARKEST HATE is not just another project, but a real band. In October 2000 they recorded their debut album "Massive Brutality" at the "House of Music" Studio in Winterbach near Stuttgart. This excellent Death Metal masterpiece on highest musical skills was engineered and mixed by Achim Koehler (Primal Fear, Pungent Stench, Sacred Steel,...) and released in April 2001 on Vile Music (new sublabel of Iron Glory Records). The album got great reviews and numerous interviews and features in all important Metal magazines and fanzines. Due to a heavy tinitus disease - René Pfeiffer decided to end his musical carreer in Sommer 2001. But only a few weeks later, MY DARKEST HATE were able to come up with two new musicians: Chris Simper on vocals (ex-Pale, ex-Disinfect) and Oliver Schort on bass (Malice in Wonderland). 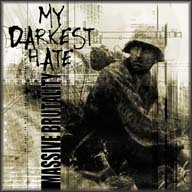 After the release of "Massive Brutality", MY DARKEST HATE got offers from several bigger record companies and finally decided to sign to Massacre Records. 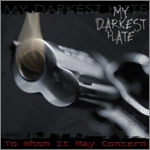 In summer 2002, MY DARKEST HATE entered the "House Of Music" studio again in order to record the follow-up album "To Whom It May Concern". This second strike shows besides of an excellent production a further improvement in songwriting and was released at the 28th of October 2002. The album achieved the 10th rank in the ROCK HARD soundcheck and got top rankings in all relevant magazines. In summer 2002, the band also had live perfomances at bigger festivals like the PartySan and Summer Breeze Open Air. After many successful liveshows the band began with the songwriting for their third album "At War" which was also recorded at "House Of Music" in February 2004. The Coverartwork for this album was created by Travis Smith (Nevermore, Opeth, Malevolent Creation, ...)! This was released via Massacre Records on May, 24th 2004. It was followed by a couple of festival appearances like the “Up from the Ground”, “Rock Harz” and the Austrian “Devil Days”. In November 2005 the new album “Combat Area” was hammered on track with producer Andy Classen (Legion of the Damned, Dew-Scented, Krisiun). The cover artwork was done by Ahmet Meran Karanitant (Six Feet Under, Leaves Eyes, ...).